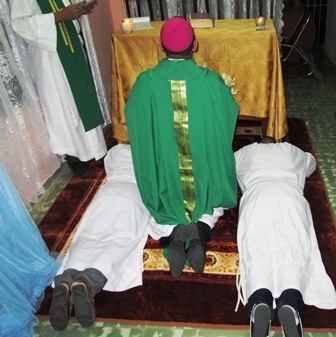 The first two deacons of the Old Mission Church, Our Lady of Joy, in Cuba, were ordained by Monsignor Ricardo Santiago Medina Salabarría, Primate Bishop of this church in Cuba, at eight o’clock on the night of the Wednesday nineteenth of June of two thousand thirteen, in the Chapel (private) of “Immaculate Mary” of the priest Alexander Pedro Rodríguez, of the Episcopal Church of Cuba, in the city of Las Tunas. 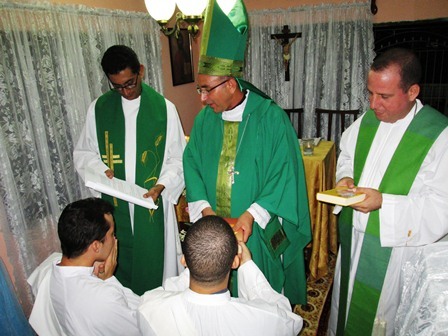 In solemn Eucharist by the grace of God, there was conferred the order of the diaconate on Leandro Cesar Mastrapa Igarza and Alexis Zayas Gerardo Guillen, after swearing obedience to bishops, singing the Litany of the Saints, and invoking the Holy Spirit, Monsignor Medina laid hands on them, prayed the consecratory prayer, after which the assistant priests lay their hands on them hands, there was given to them the evangelistary, a book that contains gospel readings, and they were vested with the diaconal ornaments. In a meeting of the clergy there an agreement was reached on the erection of the Saint Judas Thaddeus Mission in a neighborhood of the city, a mission that will be attended by the deacons and seminarians of the area, as part of their Pastoral Accompaniment Practicum.